Swamp milkweed a perennial, is larger than the more commonly grown Butterfly Weed. It bears rosy pink to bright pink flowers in July - September. It grows to 4-5' tall, and 1.5' wide. Likes boggy soil, and will not tolerate dry soil. 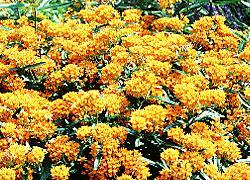 Butterfly weed is an herbaceous perennial, bearing orange flowers from July to September. The plant will not flower freely until well established. It's slow to start in the spring, so be sure and mark it. A long tap root makes transplanting difficult, if not impossible. Scarlet milkweed, though native of South America, has nicely adapted itself to the southern US. The flowers are more vibrant and showy than that of Butterfly Weed. This one does not tolerate freezing temps. I've heard that this is the milkweed of choice for monarchs. 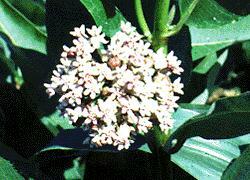 All milkweeds are host plants to several butterflies, the most well known being the Monarch. Flowers are also a great nectar source for many butterflies. Scarlet milkweed is native South America, but naturalized in Florida; Butterfly weed is native to eastern North America..
Light: Does best in full sun; In hot, humid places, they benefit from some afternoon shade. Moisture: Swamp milkweed - moist, moderately rich, neutral soil; Butterfly weed - well drained sandy/gravelly soil. 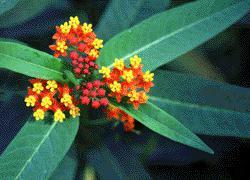 Drought tolerant, likes average to poor fertility; Scarlet milkweed - rich to average fertility, but moist soil. Propagation: By seeds. Seeds should be stratified for 3-4 weeks, except for the Scarlet milkweed (which is a tropical). Soak seeds for 24 hours prior to sowing. Put in damp, peaty soil, just barley covered, and refrigerate. Then keep soil in 50-75 degrees. Germination takes 30-90 days, however, I've found that after stratification, I put the containers on top of the fridge, and germination takes place in only a few days. Does not transplant well, so put in garden when still small. Germination rate is not great, so sow more than you'll need. Seed pods stand erect on a short stem and is about 3 inches long. Seed is oval or pear shaped, somewhat flat, and is attached to a tuft of hairs at the tip. These hairs are carried by the wind, dispersing the seeds.. I put cheese cloth 'sacks' over the pods to catch the seeds before the wind carries them away. Milkweed is poisonous to animals if eaten. But caterpillars eat it, and retain the poison in their bodies, giving them protection from preditors. Milkweed is almost totally stripped of leaves by hungry caterpillars, but will rebound in a few weeks.